Mahmoud Ali Buneyste, a young journalist became the second Somali journalist to be killed in the lawless Somali capital Mogadishu on Sunday. Relatives said that the journalist lived in exile in Nairobi for several years and had recently returned to Mogadishu to visit his sick mother. The slain journalist was filming a football game in the Towfiiq neighborhood in Mogadishu when a bullet from government soldiers hit him in the head, according to Abdirahman Yasin Ali the director of the Voice of Democracy Radio where the journalist was working. Some reports say that fighting between government soldiers erupted in the area and as a result a stray bullet hit the journalist, however other reports indicate that the journalist was deliberately killed by a government soldier. 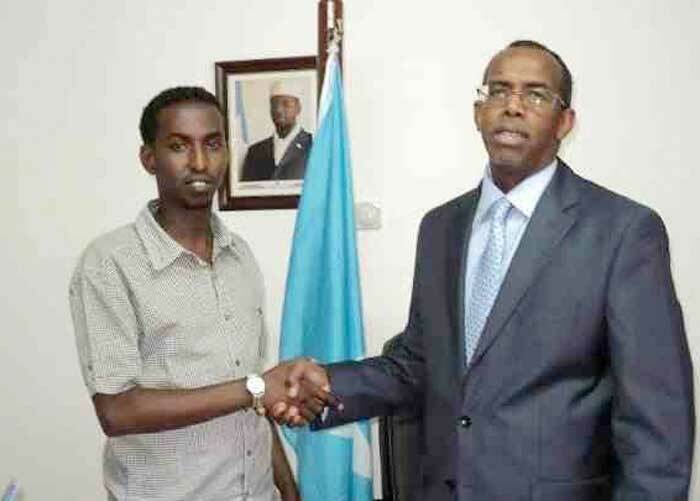 Journalist Mahmoud Ali Buneyste with Somali ambassador to Kenya, Mohamed Ali Nur, at the Somali embassy building. “We are investigating the matter to find out exactly what happened and we strongly condemn the successive killings of the Somali journalists working in the lawless country,” the President of the Somali Sports Press Association Abdi Aziz Godah Barre said in a press statement on Monday. “Buneyste’s killing comes hours after he returned from the funeral of another slain colleague Yusuf Ali Osman earlier in the day – this was really a very shocking experience,” the Somali Sports Press Association President said. Meanwhile, the Special Representative of the UN Secretary-General for Somalia, Dr. Augustine P. Mahiga, strongly condemned the killings of veteran journalist Yusuf Ali Osman and Mohmoud Ali Buneyste both killed in Mogadishu yesterday. “It was only two weeks ago that the comedian and media worker Marshale was killed in Mogadishu. Today we mourn two more members of the Somali media community, Yusuf-Farey and Buneyste,” SRSG Mahiga said. “I send my deepest condolences to their families and to all Somali media professionals, who for too long have seen their colleagues targeted, injured and assassinated without a single perpetrator being brought to justice,” SRSG Mahiga said. The UN called repeatedly on full and independent investigations to these unacceptable and cowardly acts which have made Somalia one of the most dangerous places on earth for media professionals. UNPOS reiterates its call for the TFG to strengthen its police investigative capacity and stands ready to assist however possible in this regard. Buneyste is the 9th journalist to be killed in Somalia so far this year.